I got the new one off Jenkins (TekkitRestrict 2.0 Beta 1) about a week ago and I was not talking about TekkitRestrict 1.21 Beta 2. In TekkitRestrict 1.21 Beta 2 it has a similar problem which is worse. Anyone else confirm this before I use the new one? Try using the one he just uploaded on the official bukkit downloads and tell me if it still does. Hello, Taeir thank you for the new update but I've found a glitch of some sort, the item placement limiter is able to bypass by clicking rapidly to place then bam it places even though I've hit my limit of placing that item. Thank you if you could fix this it would help my server a lot! Thank you for what you do! I have been very busy, but I was finally able to release a stable build again: TekkitRestrict 2.0 Beta 1! This version fixes many of the bugs that were bugging us all (like the tile entity crash and the anti-flyhack not working properly). It also introduces a new configuration system, which makes it possible to add a command like /tr ban item <id> <data> <message> in the future! The downside is that all the configs get reset. I decided to take the opportunity to move some settings around, create some more config files and improve explanations for settings. Once it gets approved, you can check the full change list on its download page. @Catch2223 You absolutely rock man thank you so much! I have uploaded 1.22 Dev 1 to the Jenkins server. I marked it as Untested and Unfinished, and you should use it at your own risk. 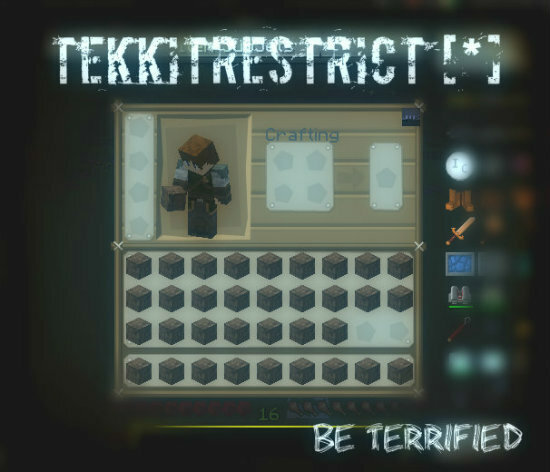 I'm releasing this version because of the numerous bugs in older versions of TekkitRestrict that have been fixed. This version however, contains a lot of half finished features. I hope someone is able to test this version thoroughly to tell me what works and doesn't work. You can ignore the messages about missing config options. I have not added most of them in the actual config files, so they will remain unless you manually add the options. New Chunkunloader command should work well, but I haven't tested it thoroughly. The logging filter is being completely rewritten to allow for filtering things from only the console, only the server.log or both. It will also include filtering on REGEX, CONTAINS, ENDS_WITH, STARTS_WITH and EQUALS and it will support CaseSensitive / CaseInsensitive. It will also include a log enhancer, which will improve/shorten some console messages to make them better readable. New version will be more informative about WHY items are removed from someones inventory. I'm glad robertjones was able to help you. That is an error of a somewhat older version of tekkitrestrict. It is not important and can be ignored.